John F Kennedy was the 35th President of the United States who served in office from January 20,1961 to November 22, 1963. What was the life of John F Kennedy like? The short biography of President John F Kennedy covers important information and facts about his early life, his family, career and the famous events and achievements of his political life. 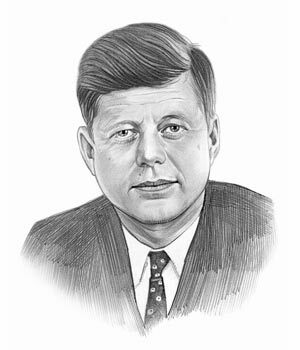 Our short biography of John F Kennedy provides an interesting and easy way to learn about the life of the President. The following important facts provide a fast overview of important facts about President John F Kennedy. Facts and Info: John F Kennedy was the 35th president of America who was assassinated in Dallas, Texas. During his term in office he forced the Russians to back down during the Cuban Missile Crisis when the world was on the brink of nuclear war. For additional info refer to 20 Facts about John F Kennedy. Facts and Info: His parents were Rose Fitzgerald Kennedy and Joseph Patrick Kennedy. They had 9 children. Jack had an older brother, Joe and two younger brothers, Bobby and Teddy. His five sisters were Rosemary, Kathleen, Eunice, Patricia, and Jean. John F Kennedy was born on May 29, 1917 in Brookline, Massachusetts. He was raised by his wealthy and ambitious parents. His father, Joseph Kennedy, was a prominent Boston political figure and the Irish Catholic community and rose to become the United States Ambassador to the United Kingdom. He worked tirelessly to see a son become the president of America. His eldest son, Joe Junior, was killed during World War 2 and it was JFK who became president. Many tragedies befell the family and JFK died an untimely death on November 22, 1963 in Dallas, Texas. Facts and Info: The career of John F Kennedy included the roles of Politician and Statesman. He received an excellent education and graduated from Harvard College. JFK became the 35th President of America in 1961 and served for 2 years until 1963. Facts and Info: John F Kennedy married Jacqueline Lee Bouvier on September 12, 1953. They had 4 children but only Caroline and John Junior survived infancy. Their son, Patrick Bouvier Kennedy, died in August 1963 and they also had a stillborn daughter, Arabella Kennedy. John F Kennedy had 3 brothers. Joseph Jr., who was a pilot, was killed on a bombing mission in Europe during World War 2. Edward (Teddy) Kennedy successfully ran for a Senate seat in Massachusetts and in 1980 unsuccessfully challenged President Jimmy Carter's re-nomination. Robert Kennedy was assassinated by Sirhan Sirhan. Facts and Info: John F Kennedy belonged to the Democrat Political Party and was the first Roman Catholic President. He was 43 years old when he was inaugurated as the 35th president. Lyndon B Johnson stood as the Vice President. JFK was the 4th president to be assassinated and the 8th to die in office. For additional facts refer to his Presidential Cabinet members. Short Biography of John F Kennedy: What he was like! Facts and Info: John F Kennedy was an imposing figure standing at He was 6 feet and a half inches in height and weighed approximately 170 lbs. A strikingly handsome man, he had reddish-brown hair, blue eyes and an engaging smile. JFK wore corrective shoes, because his right leg was 3/4 inch longer than his left. John F Kennedy had the honor of being awarded the Pulitzer Prize in 1957. Facts and Info: During his presidency he played a key role in important events of the era. John F Kennedy was instrumental in the creation of the Peace Corps in 1961. In the same year Alan Shepard became the first American in space. The Cold War continued during this time and the Berlin Wall was built. In 1961 the incident known as the Bay of Pigs occurred that was an unsuccessful action by a CIA-trained force of Cuban exiles to invade southern Cuba. The problems in Cuba escalated in 1962 culminating in the Cuban Missile Crisis when JFK forced the Russians to back down when the world was on the brink of nuclear war. Facts and Info: During his life John F Kennedy suffered from various health problems including osteoporosis, Addison disease and back problems. His chronic back ache caused him to be in pain for much of his adult life. Facts and Info: John F Kennedy was assassinated and died on November 22, 1963 in Dallas, Texas. The assassin was believed to be Lee Harvey Oswald who was killed two days later in the Dallas city jail by Jack Ruby. Various conspiracy theories have been suggested but none have been substantiated. The short biography of John F Kennedy provides a fast overview of the key facts and events about his life and the accomplishments of his presidential term in office. The following John F Kennedy video enables you to sit back and listen to the history of his personal and political life - a useful educational resource for kids, children and schools learning about the life of President John F Kennedy.